The Bourchier knot is a variety of heraldic knot. 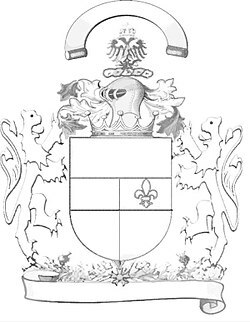 It was used as a heraldic badge by the Bourchier family, whose earliest prominent ancestor in England was John de Bourchier (alias Boucher, Boussier, etc., d. c. 1330), a Judge of the Common Pleas, seated at Stanstead Hall in the parish of Halstead, Essex. He was the father of Robert Bourchier, 1st Baron Bourchier (d.1349), Lord Chancellor of England. The various branches of his descendants held the titles Baron Bourchier, Count of Eu, Viscount Bourchier, Earl of Essex, Baron Berners, Baron FitzWarin and Earl of Bath. The knot should perhaps have been called the "FitzWarin knot" as according to Boutell (1864) the device was first used by the FitzWarin family, whose heir was the Bourchier family. The Bourchier knot is shown in two forms: as a reef knot and as a granny knot. Relief sculpture of a Bourchier knot (of the reef knot variety) on the chest-tomb in Bampton Church, Devon, supposed to be that of Thomasine Hankford (d.1453), heiress of the feudal barony of Bampton, wife of William Bourchier, 9th Baron FitzWarin (1407-1470), great-grandson of the 1st Baron Bourchier. Bourchier knots on the monument of William Bourchier, 3rd Earl of Bath (1557-1623) in St Peter's Church, Tawstock, Devon. Beningbrough Hall, North Yorkshire, owned at one time by a branch of the Bourchier family. A large Bourchier knot is cut into a lawn adjoining the house. Sculpted on the Tudor gatehouse of Tawstock Court in North Devon, seat of the Bourchier Earls of Bath. Tawstock Church in North Devon, visible on monuments to Bourchiers and Wrey baronets. Arthur Charles Fox-Davies, Complete Guide to Heraldry, 1909, pp. 390, 469.